The Healthy Company offers a fresh vision of the steps managers can take to increase worker satisfaction, boost profits, and make their companies healthy, happy, and whole. Drawing from more than 10 years of research, Robert H. Rosen, Ph.D., shows that innovative solutions to a company’s problems can be found in the hearts and imaginations of employees at every level. The Healthy Company combines theory and practice with personal questionnaires, inspirational comments from successful executives, and hundreds of specific suggestions. 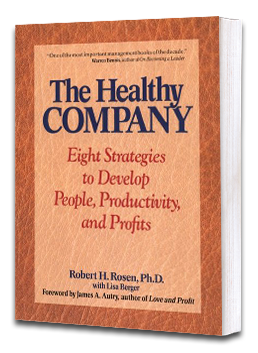 With this book, any company can become healthy, making the lives of those who work there more meaningful in every way.